Life is a Cycle route. The Town of Herndon is partnering with My City Bikes to hold a Life is a Cycle ride on Friday, May 5, 2017 at 6:00 p.m. at Bready Park. Life is a Cycle is an outdoor group fitness event where you can learn how and where to bike commute in your community. If you've ever been curious about biking for transportation, Life is a Cycle is for you! 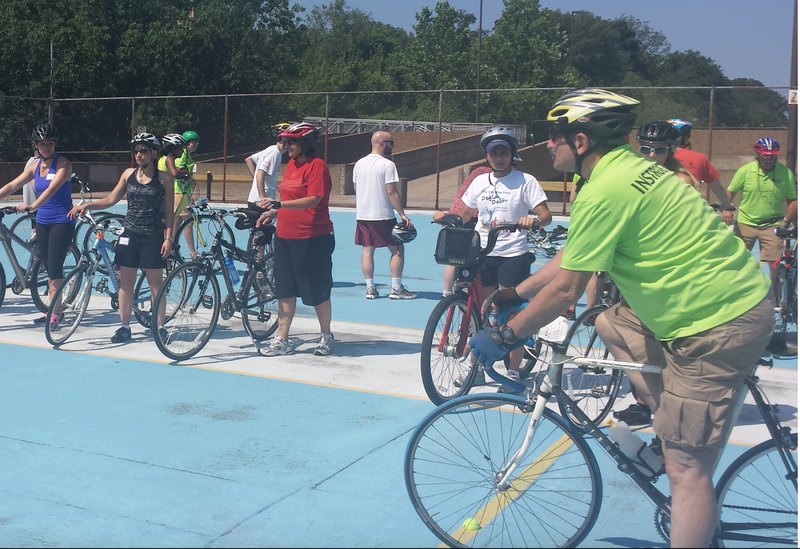 The Herndon ride will be one of 18 Life is a Cycle rides around the country during National Bike month. ​My City Bikes is a global public health alliance that creates beginner biking apps and other resources to help beginners start biking. The fee to participate is $1.50 and event proceeds will benefit the American Heart Association. You can register at http://lifeisacycle.bike. Photo courtesy of Douglas Stewart. 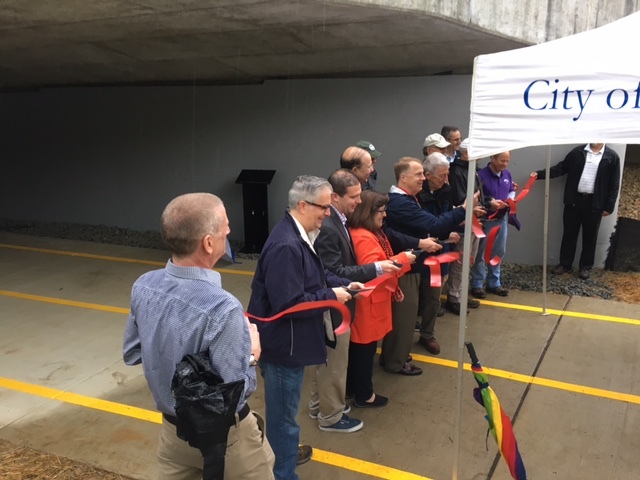 Thanks to a partnership between the City of Fairfax and NOVA Parks, the Pickett Road Trail Underpass was formally opened on Saturday April 22. Cross-County Trail riders will know this as the area at Thaiss Park where the trail hit a wall in the form of a closed sewer pipe beneath Pickett Road. 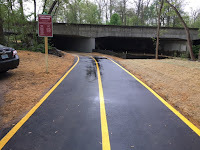 The wall is now a lovely winding path that connects to the Willcoxon Trail and Gateway Park in Fairfax City. NOVA Parks and Fairfax City partnered in 2013 to secure a Transportation Alternative Program grant from VDOT for the project. Several speakers from NOVA Parks and the City of Fairfax spoke at the trail dedication, which was presided over by City of Fairfax resident and NOVA Parks Board member Brian Knapp. City of Fairfax Mayor David Meyer spoke about the role of trails for transportation as well as recreation. Mayor Meyer emphasized the role of trails and bicycle facilities in relieving traffic congestion. Michael Nardolilli, the Vice Chair of the NOVA Parks Board, rides the CCT regularly and spoke with animation about how much better his ride will be with the new connection. The new trail link has been a long time coming, but worth the wait. Last week FABB member Alan Young helped with a Bike to School event at the Robert Frost Middle School in Fairfax. 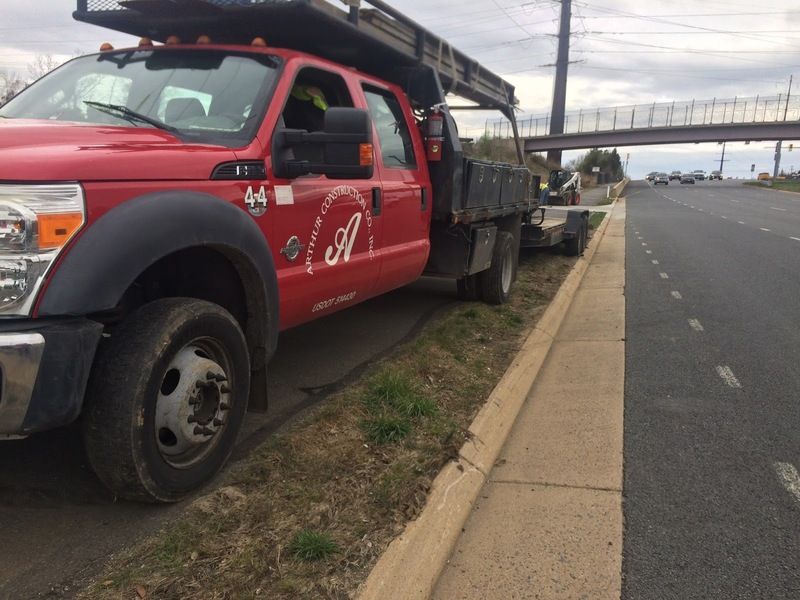 The April 21st bike to school event was the school’s first, and Alan worked with Sally Smallwood, the Fairfax County Public Schools Safe Routes to School Coordinator, to provide help on maintenance and safety checks. Fourteen riders participated, had fun, and benefited greatly from the advice shared by Alan. Many thanks to Alan and Sally for all of their work in helping Fairfax children bike safely as part of a healthy and active lifestyle. If you have participated in or know of similar bike to school or other Bike Month events, please share your stories by sending them to steve@fabb-bikes.org. We have good news for people interested in improving their bicycling skills or just learning how to bike. 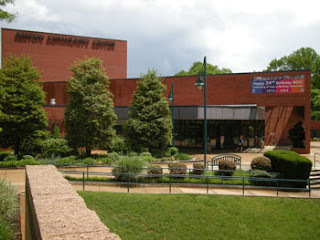 There will be a series of workshops and classes taught this summer at the Reston Community Center by FABB member and certified cycling instructor Kelley Westenhoff. And, yes, we realize that most FABB members probably are experienced enough to not need classes. But, we bet that you may know someone or some kids who would like to learn to bike. Or perhaps you have a friend or neighbor who has seen the new Bike Share stations around the county, has started thinking about trying bicycling commuting, and would appreciate some advice on being a more confident, comfortable, and safe rider. If so, please help spread the word and let people know that registration opens for Reston residents on May 1, 2017, and for non-residents the following week on May 8, 2017. Crash Avoidance - Sunday, 30 July 2017. 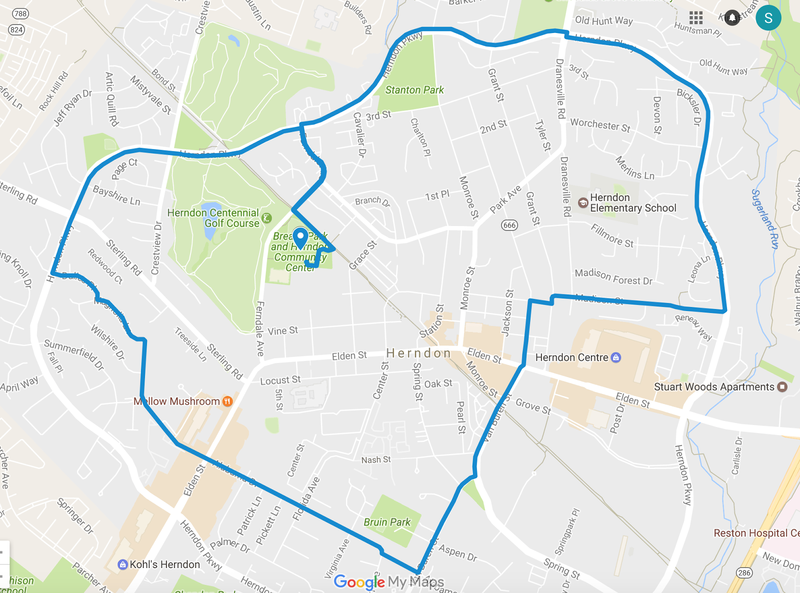 Confident Road Cycling - Sunday, 13 August 2017. You can sign up for individual workshops or for all three. The cost for each workshop is $45 for Reston residents and $68 for non-residents. Please go to the RCC website for details on registration. There also will be a Learn to Bike class for children (6-14 years old) and one for adults (15 years and older). These classes are for people who have never learned to ride a bike or need to relearn the basics. The certified instructors use a technique that is intuitive and will take students through a progressive curriculum that covers balance skills, basic steering skills, and basic braking skills and has a very high success rate. These classes will also be taught at RCC Hunters Woods. Learn to Bike for Youth - Saturday, 1 July 2017, from 1:00 – 4:00 pm. 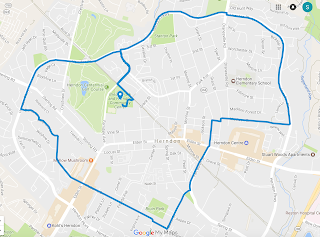 Learn to Bike for Adults - Saturday, 22 July 2017, from 1:00 – 4:00 pm. The RCC website has details on registration for these classes. For more information check out page 24 of the Adobe file (page 46 in the guide) of the RCC 2017 Summer Program Guide. 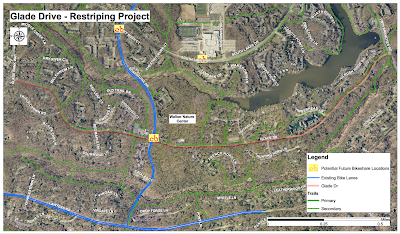 FABB is asking members and others interested cyclists and pedestrians to attend the community meeting hosted by the Fairfax County Department of Transportation (FCDOT) on proposed Glade Drive street design improvements next week. The meeting will be held on Thursday, April 27, 2017, at 6:30 p.m., in the cafeteria of Hunters Woods Elementary School, 2401 Colts Neck Road, Reston. The purpose of the meeting will be to gather community input on various proposals to improve traffic safety, bicycling and the pedestrian environment on Glade Drive during the scheduled repaving this summer by the Virginia Department of Transportation's (VDOT). In particular, there will be a discussion of new bike lanes and sharrows that have been proposed for Glade Drive from Glade Bank Way to Twin Branches Road. There will be an open house at 6:30 p.m., and then representatives from FCDOT and VDOT will present plans for the project, which includes sharrows/shared lane markings, bike lanes, crosswalks and pedestrian improvements, starting at 7 p.m. Hope to see you there. 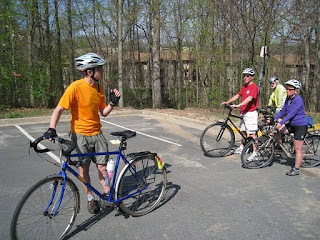 Join FABB for two social rides to Sully Historic Site for SpringFest Fairfax on Saturday, April 29. "SpringFest is a day of environmental and wellness workshops, interaction with environmental groups, and opportunities to learn how to keep Fairfax County Clean, Green and Healthy–all while having a great time!" The rides will leave from Centreville and Reston. Both groups will meet at 9:15 a.m. and will depart at 9:30. The Centreville ride start location is Stringfellow Road Park & Ride lot, 4920 Stringfellow Road, Centreville, just north of I-66. That group will ride about 7 miles, mostly on trails, to the Sully Historic Site. The Reston ride will begin at Wiehle-Reston East Metro Station. 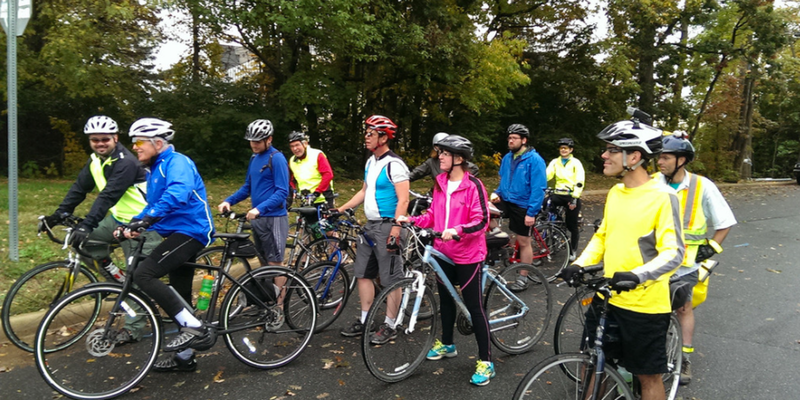 That group will ride about 10 miles along bike lanes, neighborhood streets, and paved trails. Ride leaders will point out points of interest along the way, including the county's two secure bike rooms and other new bike facilities. This is not a race; both groups will ride together, as a group at a slow pace, stopping occasionally to regroup. Once at Springfest, lunch can be purchased from one of the food trucks that will be present. Around 1:00 p.m. the groups will ride back to the starting points. Register for the Centreville or Reston ride on Eventbrite. Everyone must wear a helmet and sign a waiver of liability. For more information Contact FABB. 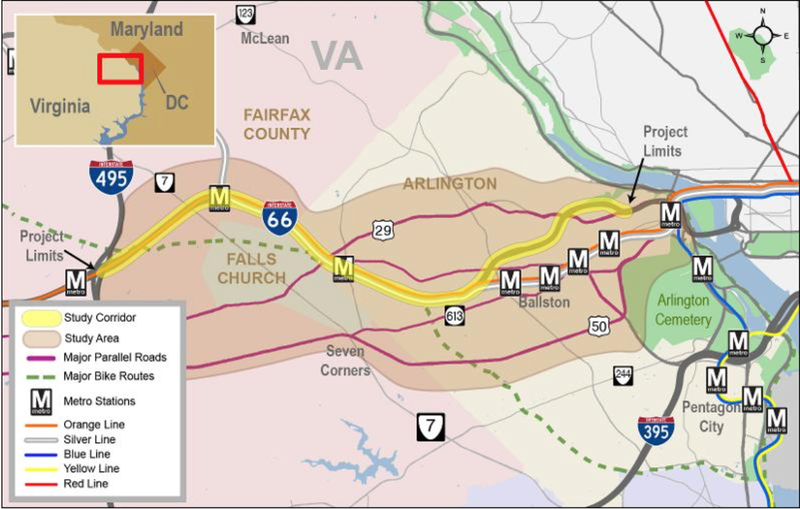 As part of the Transform 66 Inside the Beltway Eastbound Widening Project, the Virginia Department of Transportation (VDOT) will host a public meeting on the W&OD Trail pedestrian and bicycle bridge over Rt. 29 on Tuesday, May 2, 2017, from 6:00-8:00 p.m. at Yorktown High School, 5200 Yorktown Boulevard, Arlington. This is a follow-up meeting to present a bridge option that was developed based on public input received during the planning workshop held on April 5, 2017. VDOT staff will be available to discuss the project and answer questions between 6:00-6:30 p.m. and will then give a short presentation on the proposal. This is another great opportunity for cyclists who use the W&OD (and isn't that just about everyone) to provide input to the important infrastructure addition. Please mark your calendars and plan on being there. If you unable to attend the meeting you can email your comments or questions to Transform66@VDOT.Virginia.gov or send written comments to Ms. Amanda J. Baxter, Special Projects Development Manager, VDOT Northern Virginia District, 4975 Alliance Drive, Fairfax, VA 22030. Please reference "W&OD Trail Bridge" in the subject line. Comments must be submitted by May 18, 2017. Please plan on joining FABB next week for our April meeting in Falls Church. We have a great program planned to learn about upcoming city and nearby county efforts to make bicycling better. Falls Church Principal Planner Paul Stoddard and FCDOT’s Adam Lind will be there to provide the details. 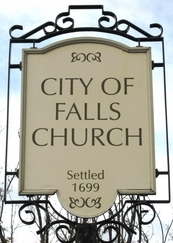 The meeting will be held at 7:30pm, April 19, in the Dogwood Room, Falls Church City Hall at 300 Park Avenue. See you there! Join Access Tysons and Fairfax Alliance for Better Bicycling (FABB) for an introductory ride around Tysons’ bike trails Sunday, April 23rd (Rain Date: May 7th) at 9:00 a.m. for a PROMPT 9:30 a.m. departure. Refreshments and Giveaways at Tysons Corner Center from 9:00am – 9:30am. Group Departs Mosaic District to return to Tysons Corner Center at 10:30am. The Route: Starting at the Capital Bikeshare station in front of the VITA apartments, 7902 Tysons One Place, Tysons Corner, Va 22102, and traveling to the Mosaic farmer’s market and returning to Tysons Corner Center. The Distance: We’ll ride 8 miles round trip, or about 40 minutes. All levels of biking experience are welcome – this is not a race! Don’t have a bike? No problem! A Capital Bikeshare station is located at Tysons Corner Center. Note there is not a Capital Bikeshare station located at the Mosaic District, so those renting bikes will need to make plans to return their bike back at Tysons Corner Center or at another bikeshare station nearby. 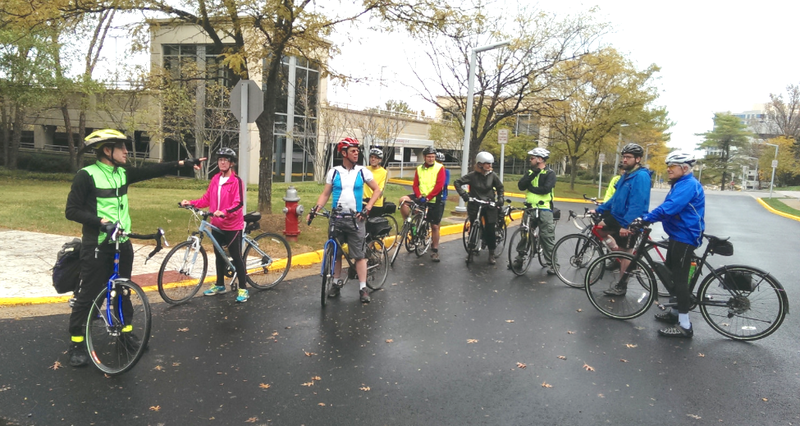 FABB and Access Tysons representatives will be biking back to Tysons Corner Center at 10:30am. Participants will need to sign releases from both Tysons Corner Center and FABB before participating. Helmets are required for all group ride participants. 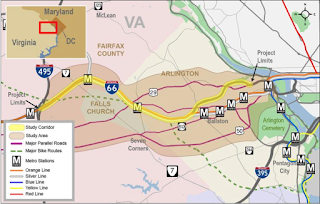 For those who do not wish to return to Tysons Corner Center, the Dunn Loring Merrifield Metro station is less than a mile from the Mosaic District. 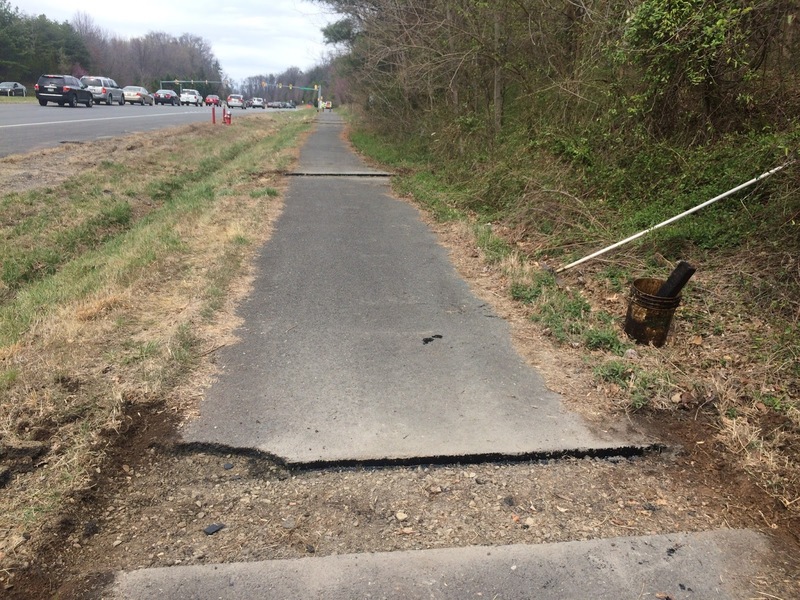 VDOT has contracted with Arthur Construction Co. to repair sections of the Fairfax County Parkway paved trail. Yesterday we encountered work crews between the W&OD Trail and Route 7. Signs were posted that the trail was closed and construction vehicles blocked sections of the trail. I was able to navigate through the work area. 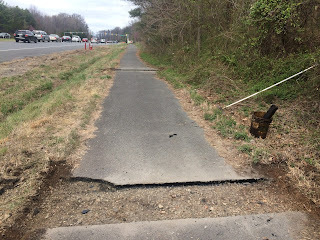 When the Parkway trail was repaired in 2014 VDOT coordinated closely with FABB in advance of repairs on sections of the trail. VDOT also posted signs showing nearby bike routes that could be used for detours. During that time we asked that trail users be allowed to pass through the work areas when feasible. That arrangement worked well. Unfortunately there has been almost no coordination this year. We hope that in the future the entire trail will be repaved, possibly in long sections. Patching small 2-3 foot sections of the trial is costly, takes significant manpower, and does not last as long as repaving. If you hear of problems related to this maintenance work, please either comment below or send us a note at info@fabb-bikes.org. 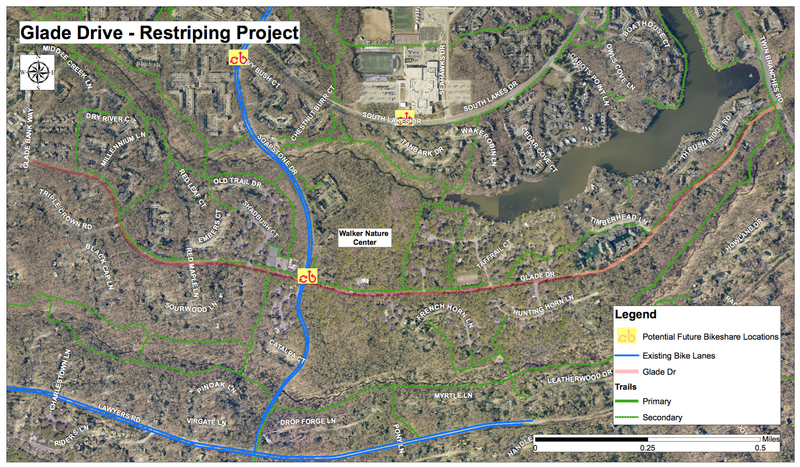 On Wed. April 5 Fairfax County is holding a meeting to discuss proposed bike facilities on Woodford Road. The meeting will be held from 6:30 to 7:30 p.m., in the cafeteria of Kilmer Middle School, 8100 Wolftrap Road, Vienna. Woodford is a primary access road into Tysons. Cyclists are encouraged to attend the meeting to learn more about the project, provide feedback, and support the county's efforts to make Tysons a more bike-friendly place. 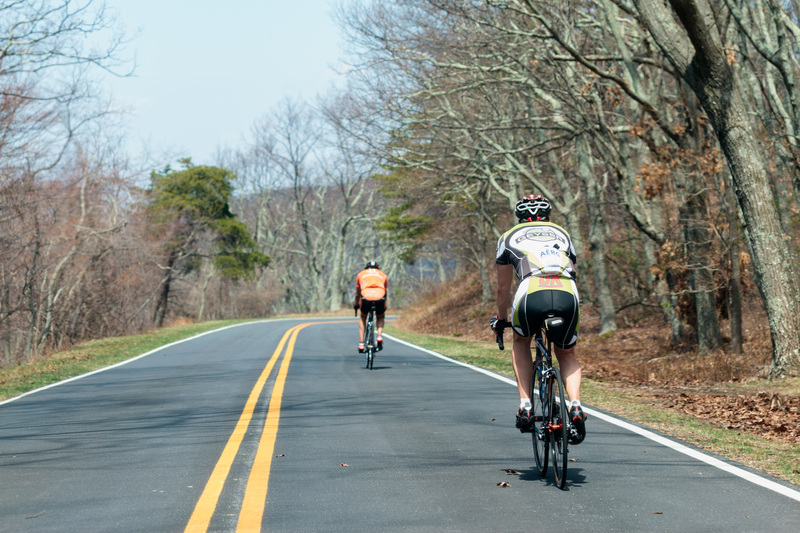 Mark your calendars: On April 23 you'll be able to enjoy a car-free ride on Skyline Drive. From the Front Royal (mile 0) entrance to Thornton Gap (mile 31.5) motorized traffic will be banned (map). As a bonus, entry to the park is free on that day. “Ride the Drive” is a pilot event to promote opportunities for alternative modes of transportation and recreation, promote health and well-being, and enhance the visitor experience by providing an opportunity to access the Park in a unique way. ”Ride the Drive” is open to bicycles and other non-motorized vehicles. Registration opens March 10 and is required but does not guarantee a parking space. Registration information can be found on the Park website at www.nps.gov/shen/ride-the-drive.htm. The event begins at 7:00 a.m. and ends at 5:00 p.m. Parking will be in Front Royal at Skyline High School (151 Skyline Vista Drive, Front Royal). There will also be limited parking at Panorama Comfort Station (mile 31.6 Skyline Drive) with overflow at Hearthstone School (11576 Lee Highway, Sperryville). The Park will not be offering a shuttle service. To ensure a safe event, all participants will obey the rules of the road, maintain control of their bicycle or non-motorized vehicle at all times, abide by the 35-mile-per-hour speed limit, stay in their lane of traffic, and follow all other Park regulations and policies (i.e., lights in foggy and rainy conditions, etc). This is an encouraging move by NPS, similar to the opening of Yellowstone National Park to bicycles each spring. Let's hope this becomes a tradition in Shenandoah National Park. Just a quick reminder that the Virginia Department of Transportation (VDOT) will host a planning workshop this Wednesday, 5 April, on the W&OD Trail Pedestrian and Bicycle Bridge over U.S. Route 29 (Lee Highway) project. 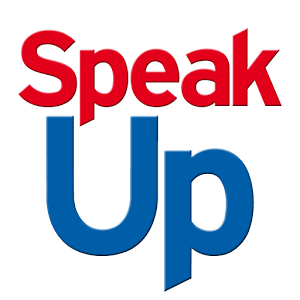 The workshop will be from 6:00-8:00 p.m., at Yorktown High School, 5200 Yorktown Boulevard, Arlington. FABB members and others interested in supporting this critical improvement to the W&OD Trail are encouraged to attend and make their views known.